AtoM maintains an Elasticsearch search index to provide fast, full-text search results with faceting. Occasionaly it is necessary to repopulate the Elasticsearch index from the primary database, especially after operations that affect many records, e.g. Populating the search index requires running a Symfony command line task, which is located in the root directory of the application. Running this task will delete the current index, then repopulate and optimize the index. Depending on the number of records in your installation, this can take a while to run - for production sites, we recommend running this task after regular business hours. The --application and --env options should not be used - AtoM requires the uses of the pre-set defaults for Symfony to be able to execute the task. The --exclude-types option can be used if you do not want to re-index certain record types. When this option is used, the existing index is not completely flushed - the current part of the index for the excluded types will be maintained, while other entities will be flushed and re-indexed. 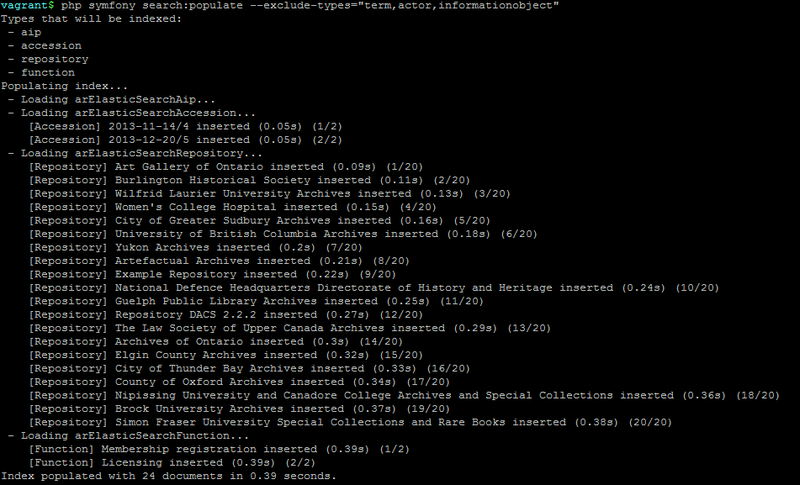 This can be useful if, for example, you have many archival descriptions (which would take a long time to re-index), but only need to re-index your authority records and/or other entities - you could then use the command with --exclude-types="informationobject and the existing index for descriptions would be maintained. Pressing enter will continue and run the search:populate task (with no types), or alternatively, you can exit the task by entering CTRL+C and then re-enter your parameters, using --exclude-types as needed.